Police In California had to pull a crashed Model 3 out of a creek. The additional crime they arrested the employee for. Police in the Santa Clara County community of Morgan Hill say they arrested a Tesla driver this week who had just crashed a new Tesla Model 3. SFGate News reports that the police said the driver had a "strong odor of alcohol on his breath." In addition to charges of suspected drunk driving resulting in a crash, police told SFGate that the driver was also arrested for Delaying An Investigation. This, stemming from the driver's refusal to provide a sample for the analysis of Blood Alcohol content, as required by California law. The Mercury News reported January 18th, 2018 that police confirmed Flynn is an associate manager at Tesla, Inc. who installs home chargers. The Mercury News also says that Tesla, Inc. did not immediately return its requests for information on the driver or the case and that a Linked In profile for a person with the same name and information was taken down. Police were unable to determine if the crashed vehicle belonged to Flynn personally, or if the vehicle was owned by Tesla, Inc. No reports indicate that the driver was operating the vehicle while in any official company capacity. The Tesla Model 3 is Tesla's newest model and currently starts at a price of $45,000. Instead of sale to the general public, Tesla opted to sell its Model 3 only to employees in its initial launch. That launch has gone badly and the Model 3's production timeline is about six months behind schedule. The Model 3 is a very rare automobile at this stage with only about 4,000 in circulation. This crash may well be one of the first to total a Model 3. 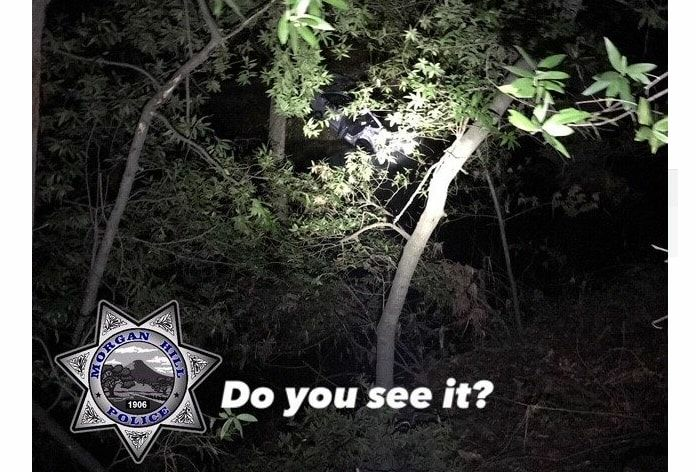 The image above and a description of the incident was posted to the Morgan Hill PD's Facebook page at the time of our story's publication. Police say the driver reported he swerved to miss hitting a deer and went across the opposite lane, down an embankment and ended up in a creek. Police said removing the vehicle was no easy task. They went on to add in their post, "We've been promised cars with special capabilities, cool tricks, and gadgets for the last 30 years and WE ARE STILL WAITING!"